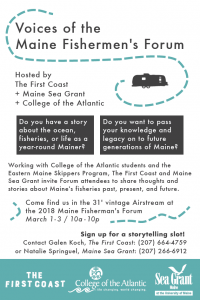 Voices of the Maine Fishermen’s Forum: An oral history project to capture Forum participants’ stories and fishing legacy forever! Come be interviewed during the Maine Fishermen’s Forum, March 1-3 in Rockland, Maine. Tell your stories about fishing and the fishing industry, and share your legacy for the next generation of fishermen! 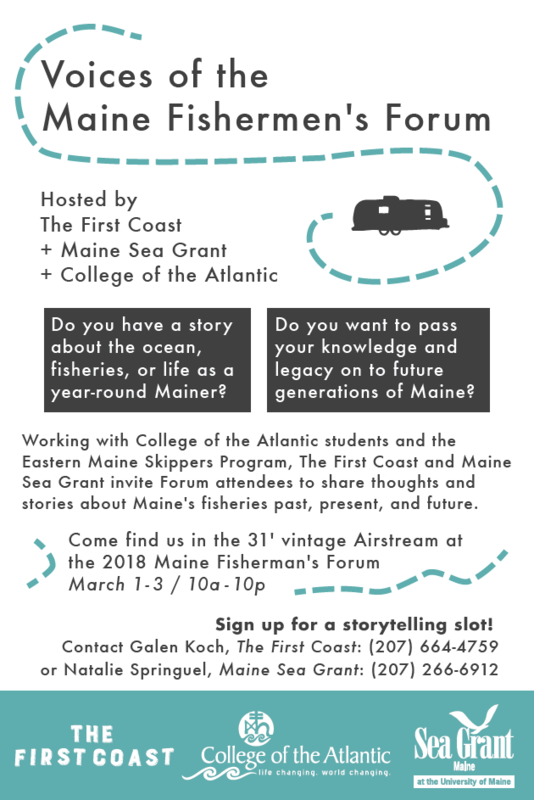 Every Forum attendee is welcome to step aboard The First Coast’s Airstream mobile recording studio, parked by the Samoset’s front entrance, to help document Maine’s fisheries legacy. Whether you have a specific fisheries-related story you want to share, or prefer being interviewed in a Q&A fashion; whether young or old; fisherman, family member, friend, or are somehow connected to the future of Maine’s fishing industry, we want to hear from you. Sea Grant, The First Coast, and College of the Atlantic are working together to bring The First Coast’s mobile audio recording studio (a re-furbished Airstream) to the Forum where it will be parked in a visible location at the Samoset and open 10 AM to 10 PM all three days for walk-in and pre-scheduled oral history sessions. 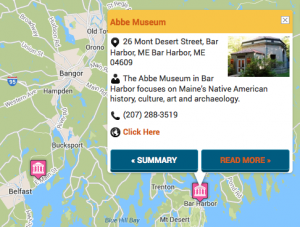 All audio will be archived in a publicly accessible location, and stories of Maine’s fishermen and our changing coast will be produced from the audio. If all goes well, we hope to make this an annual feature of the Maine Fishermen’s Forum, so that the legacy of our fishing communities is preserved forever.